For best results use with Jarrow Formulas® BioSil™ the Biologically Active Silicon. Take 1 to 6 capsules per day with meals, preferably dividing the number of capsules equally with each meal to facilitate maximum absorption, or as directed by your qualified health consultant. Do not use if allergic to shellfish. Other Ingredients: Magnesium stearate and silicon dioxide. Mineral amounts are elemental. Capsule consists of gelatin. Contains: Soy. This is the perfect calcium supplement and it gives you just the right amount that you need in order to build stronger bones. My bones density has definitely increased. 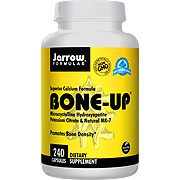 Super Size Bone-Up - is shipped in a discrete, unmarked package. Orders are processed immediately and usually take about 3 to 5 working days to be received. We do ask that you try it for 2 to 3 weeks to feel the full effects. Any information received is used only for order processing and shipping purposes. Your information, such as e-mail address, will never be disclosed to a third party.